When you stay at Four Seasons Resort Orlando At Walt Disney World Resort in Lake Buena Vista, you'll be next to a golf course, just steps from Walt Disney World® area and Walt Disney World® Resort. This 5-star resort is 4.4 mi (7 km) from Disney Springs® and 4.7 mi (7.6 km) from Epcot®. Make yourself at home in one of the 443 air-conditioned rooms featuring refrigerators and iPads. Your pillowtop bed comes with premium bedding. Rooms have private furnished balconies. 55-inch LED televisions with cable programming provide entertainment, while complimentary wireless Internet access keeps you connected. Private bathrooms with separate bathtubs and showers feature complimentary toiletries and hair dryers. Enjoy Spanish cuisine at Capa, one of the resort's 5 restaurants, or stay in and take advantage of the 24-hour room service. Snacks are also available at the coffee shop/café. Relax with a refreshing drink from the poolside bar or one of the 5 bars/lounges. Buffet breakfasts are available for a fee. Featured amenities include a 24-hour business center, limo/town car service, and express check-out. 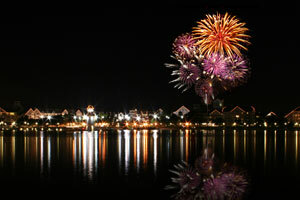 Planning an event in Lake Buena Vista? This resort has facilities measuring 37750 square feet (3507 square meters), including conference space. The preferred airport for Four Seasons Resort Orlando At Walt Disney World Resort is Orlando, FL (MCO-Orlando Intl. ).